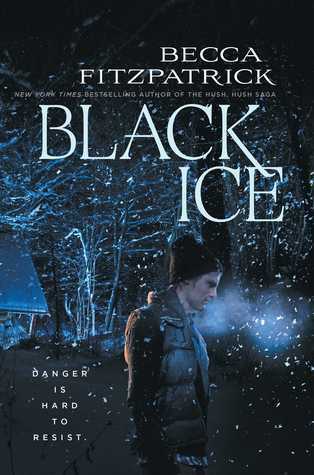 My latest read, Black Ice by Becca Fitzpatrick, features heavy snow, serial killers, deception and secrecy, surviving in the most extreme conditions, and a fair amount of violence. What did I take away from it, though? Don’t go hiking. Don’t go backpacking, camping, or anything else that involves being “one with nature.” Actually, don’t go outside and interact with people, and you’ll be just fine. A message from your hermit-in-training. All jokes aside (though I’m really not joking), Black Ice is a thrilling–and sometimes aggravating–book that will likely keep many readers guessing until the very end. I thought I knew what was going on through most of the book, but even I was thrown for a loop a couple of times. I do like a book that keeps me on my toes. Many girls spend spring break of their senior year at the beach–swimming, hanging out with friends, relaxing, and getting ready for that final push to graduation. Not Britt Pheiffer. Britt is planning to hike the Teton Range with her reluctant best friend, Korbie. Britt’s ex-boyfriend (and Korbie’s older brother), Calvin, is also along for the ride. Britt isn’t thrilled about that particular development, but maybe forced proximity will give her closure regarding the end of their relationship…or ignite a whole new spark. Circumstances, however, force Britt and Korbie into a dangerous situation before they’re able to meet up with Calvin. While driving to Korbie’s family lodge, the girls encounter extremely hazardous conditions. The two girls are forced to abandon their car and look for shelter before they freeze to death. They eventually find a remote cabin, occupied by two young men, Shaun and Mason, who appear to be very normal at first glance. But there’s nothing normal about this situation. Britt and Korbie quickly learn that Shaun and Mason are on the run, and they’ll do whatever is necessary to evade capture. That includes forcing Britt, a self-proclaimed expert in navigating the area, to lead them to the highway. They leave Korbie behind and journey into the frozen wilderness. Britt hopes that Calvin will somehow come to her rescue, but she’s ultimately responsible for saving herself. She looks for opportunities to escape, and she becomes even more determined when she discovers shocking evidence that her captors may be responsible for the deaths of several local girls. Something, though, is not adding up. Britt thinks that Shaun, the more violent of these two fugitives, is capable of murder, but she’s not so sure about Mason. He seems to have some sort of moral code, and Britt has observed some tension between Mason and Shaun. Could there be more going on here than meets the eye? Can Britt possibly count on Mason to be an ally? Or is he really the more dangerous of the two men? As Britt navigates this terrifying, treacherous, confusing reality, she reflects on her relationships with Calvin, Korbie, her own family, and she comes to understand that she’s much stronger than even she realized. And she’ll need that strength for what’s to come. As Britt moves closer to what appears to be her salvation, she also uncovers some horrifying secrets–secrets that shake the very foundation of her world and place her in a more perilous situation than she could have ever dreamed of. So…Black Ice definitely kept me on the edge of my seat–and that’s great–but this book was not without its issues. Maybe they’re more my issues than anything else, but I’ll address them anyway. First up, there’s Korbie. I 100% loathe this character…and I figure I’m supposed to. It’s obvious to me–and to Britt–that Korbie is not a good friend. She acts superior and spoiled, and I seriously doubt she would have thought of Britt’s safety over her own. Her attitude provides a good contrast to Britt’s, and that’s probably the best thing I can say about Korbie. I also wasn’t a huge fan of the way too neat and completely unrealistic ending. It was much too “rainbows and sunshine” for my taste, especially in a book that had been so intriguing up to that point. Even with these issues, I did enjoy Black Ice. It was exciting, easy-to-read, and kept me engaged the whole way through. I think it’s a great fit for YA suspense collections. If you’d like more information on Black Ice and other books by Becca Fitzpatrick, visit the author’s website. You can also connect with the author on Facebook, Twitter, and Pinterest. These Broken Stars, the first book in the Starbound series by Amie Kaufman and Meagan Spooner, has been out for a few years. For whatever reason, I just managed to read it recently (even though I think I bought it soon after it came out). It took me a little while to get invested in this first book, but, once I did, it took me on quite the thrill ride. I actually finished the last two-thirds of the book today. I can’t tell you what else I accomplished today because I was so invested in this incredible piece of YA science fiction. Good times. Wealthy socialite Lilac LaRoux and soldier Tarver Merendsen are both passengers aboard the Icarus, a luxurious spaceship making its way across the galaxy. These two young people, separated by class, are very different, but circumstances are about to force them together in a way that neither of them could possibly anticipate. When the Icarus is thrust out of hyperspace, Lilac and Tarver end up together on an escape pod, and they crash into the planet below. They are the only survivors. Tarver’s primary focus upon landing is survival. As a soldier, he’s been in adverse situations before, and he seems to know exactly what to do. Lilac isn’t so certain. She’s faltering, but she finds the strength she needs to keep moving, even when it’s obvious that Tarver expects her to break down. Breaking down becomes a very real possibility as Tarver and Lilac make their way across this unfamiliar, desolate, and virtually uninhabited world. Their goal is to somehow make it to the wreckage of the Icarus…and the slim hope of rescue. But there’s something else going on here as well. Strange whispers seem to be guiding these two, leading them toward something. Are these whispers friends or foes, and what are they trying to tell Tarver and Lilac? While Tarver and Lilac look for answers on this odd planet–and the hope of rescue grows dim–they also begin to look past their differences and form a nearly unbreakable bond. Maybe rescue isn’t what they want at all anymore. Returning to their old lives could tear them apart, and neither of them is ready for that. Ready or not, forces are at work that have the power to destroy everything. Tarver and Lilac will face losing their minds, each other, and everything they ever believed about their place in the universe. Will they be able to face what’s coming and stay together? Or will they survive certain disaster only to be torn from each other’s arms? Some of you are probably wondering if this book is appropriate for middle grade readers, and I’m honestly not sure. Portions of the book are rather intense, given the circumstances the characters find themselves in. There’s also the matter of Tarver and Lilac exploring their physical relationship. There’s nothing gratuitous, but it’s obvious what’s going on. Personally, I think These Broken Stars is fine for readers in eighth grade and up, but I doubt I’d put it in the hands of a sixth or seventh grader. Do with that what you will. 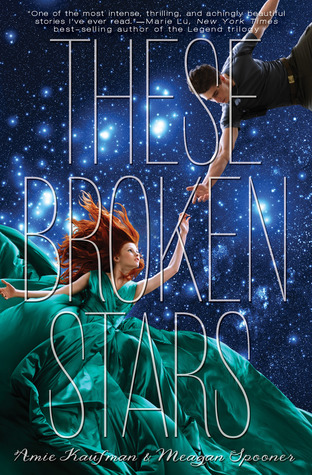 If you like Beth Revis’ Across the Universe series (Across the Universe, A Million Suns, and Shades of Earth), I think you’ll definitely enjoy These Broken Stars…and probably the rest of the Starbound series. Speaking of the rest of the series, book two is This Shattered World, and it introduces a new couple. Book three, Their Fractured Light, brings together the characters from books one and two while also giving readers a new duo to root for. There’s also an ebook novella, This Night So Dark, which focuses on Tarver and Lilac and bridges the gap between books one and two. All of these stories are already out, so I don’t have to wait to dive right in. Yay! For more information on the Starbound series, visit Amie Kaufman’s website or Meagan Spooner’s site. You can also find out how to connect with them on social media on their respective sites. Last night, I finished yet another book that I got to read courtesy of NetGalley. 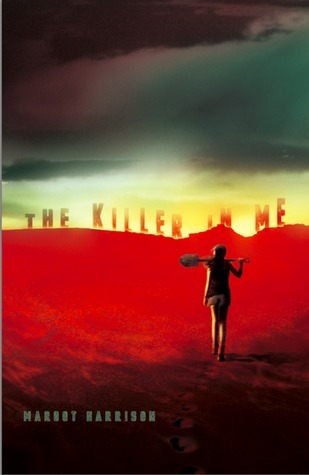 This book, The Killer in Me by Margot Harrison, is due out on July 12th, and it’s a great read for teens and adults who like murder mysteries and psychological thrillers. Nina Barrows has been plagued by strange dreams for as long as she can remember. Every night when she closes her eyes, she sees the life of another–a man she knows as the Thief. This man is a killer, and he’s good at what he does. He leaves no trace of himself or his victims, and no one suspects what he’s truly capable of. She’s done enough research to believe that the Thief is real, even if she only knows of his exploits through her dreams. She needs to catch him in the act and expose him for the killer that he is. But how? How can one teenage girl expose a serial killer, especially when there’s no evidence–other than the images in her own mind–of what he’s done? Who would believe her if she told the truth about her dreams and their connection to possible criminal activity? Would they think she had something to do with these killings? More to the point, does she have something to do with them? Eventually, Nina finds help in the form of Warren, a guy from school who would do nearly anything for her. He accompanies her on a quest to find the truth about the Thief, a man they come to realize is a seemingly normal guy named Dylan Shadwell. Nina and Warren track Shadwell to his home in New Mexico. It is here that Nina uncovers a shocking truth that could change everything she thought she knew about herself, her dreams, and her complicated past. What is Nina’s connection to Dylan Shadwell? Is he really the normal guy he seems to be, or is he playing an elaborate game with Nina at the center? Will Nina’s obsession with uncovering the truth amount to a wild-goose chase, or will she discover more than she ever wanted to know? Who is the Thief? Is it Shadwell? Is it Nina? Is this mysterious killer even real…or is he a figment of Nina’s imagination? Discover the remarkable truth for yourself when you read The Killer in Me by Margot Harrison. I don’t want to give more away than I already have, so I’m going to wrap things up quickly. It’s enough to say that there are some “Holy crap!” moments in this book. Some you may be able to see coming. Others will likely shock you. You’re in for a thrill ride either way. In my most humble opinion, The Killer in Me is a good book for upper middle grade, teen, and adult readers. Yes, it’s essentially about a serial killer–who may or may not be real–and that brings with it some gruesome imagery. It’s not, however, gratuitous. It’s true to the story and is not overly graphic (most of the time). Some middle grade readers will be able to handle it. Know your readers, and recommend this book accordingly. If I’ve whetted your appetite for this book and you’d like to learn more about The Killer in Me, visit author Margot Harrison’s website. You can also connect with her on Twitter and Instagram. Juneau, a seventeen-year-old girl living with her clan in the Alaskan wilderness, has grown up knowing that she is one of the few survivors of the fallout of World War III. She and her clan commune with nature and avoid anything and everything outside of their boundaries. Juneau is set to become the clan’s new sage, she feels connected to Yara, or the force that holds all of nature together, and she is confident of her place in the clan. Everything changes, however, when all Juneau has ever known disappears in an instant. She knows something is amiss when, while on a hunting trip, she hears helicopters in the distance. Juneau rushes back to her clan only to learn that no one is there. Everyone, including her father, has been kidnapped, and Juneau is the only one left to discover why and where they were taken. It’s up to her to rescue them from an uncertain fate. Juneau crosses her clan’s boundaries for the first time in her search for answers, but she’s not prepared for some of the answers she receives. It seems that nearly everything she believed was a lie. There was no World War III, no nuclear devastation, no reason for her clan to be so isolated. So why were they? Why have they been taken now? And what do those responsible for her clan’s disappearance want with Juneau? Someone who may have the resources to answer at least one of these questions is Miles. Miles Blackwell is the eighteen-year-old son of a pharmaceutical firm CEO. While Miles is at home–after being kicked out of school–he overhears his father talking about the search for a young girl in Alaska. He figures that he can maybe find this girl and somehow get back in his father’s good graces. What could possibly go wrong? Miles is on the hunt for Juneau while Juneau is searching for her clan, and the two eventually cross paths. Miles doesn’t exactly buy all of the Yara stuff that Juneau is talking about. His goal is to turn this girl in to his father. Eventually, though, he comes to realize that there is something special–supernatural even–about this girl, and he begins to change his tune. He wants to help her, but how? And what exactly does his father want with her? If you’re as avid a reader as I am, you no doubt know the frustration that comes when you get close to the end of a book and there simply aren’t enough pages for everything that needs to happen. That’s what I endured as After the End drew to a close, so it’s good that there’s another book, Until the Beginning, to look forward to, but I’m still a little dissatisfied. Hopefully, that feeling will change when I read book two. Minor frustrations aside, I do think After the End is a good book. It’s gripping, puzzling, and thought-provoking. The two different perspectives in the book–and how they come together–make for a very interesting read, and the larger ethical dilemmas presented in the book could lead to some intriguing discussions. 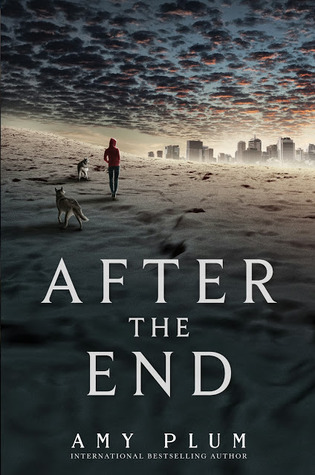 If you’d like to learn more about After the End and other books by Amy Plum, check out the author’s website. You may also want to connect with her via Twitter, Facebook, Goodreads, and Instagram. As of this afternoon, I’ve now read four of April Henry’s books. In addition to The Girl Who Was Supposed to Die, I’ve read The Night She Disappeared, The Body in the Woods, and Torched. All of these books have convinced me that April Henry is one of my go-to authors for YA suspense. These books are fast-paced, thrilling reads that captured my attention and wouldn’t let go…and they’re all perfect when it’s gloomy and grim outside and you want a book to match that feeling. The Girl Who Was Supposed to Die, which has been out for a couple of years now, is probably the quickest read of all of the April Henry books I’ve read. The chapters are short, but they pack quite a punch…as does the book’s protagonist. She comes to in a cabin. She doesn’t know where she is, what’s happened to her, or how she got here. She can’t even remember who she is. All she knows is that two men are standing over her, and it’s crystal clear that they intend to kill her. Why? What exactly do they think she knows? When opportunity strikes, so does she. She does what she must to get free of one of her attackers, and she’s amazed at the defensive skills she displays. Where did she learn these skills…and why would she need them in the first place? She’s now on the run, and she doesn’t know who to trust. She simply knows she must find some way to access her memories, no matter how painful they may be. With killers closing in and the possibility of being framed for heinous crimes, this girl needs to find help…fast. Help comes in the form of Ty, a young man working the late shift at McDonald’s. He recognizes something in this girl that he’s experienced himself: desperation. Even though it could cost him his very life, he offers assistance and works to help her uncover the truth…about herself and the terrible circumstances that have led to this horrific, unimaginable situation. As the truth comes to light, this girl–whose name is Cady–finally understands what’s going on around her: why she’s a target, what’s happened to her family, and why those hunting her must be stopped. It’s not just her life on the line. The fate of the entire world could be at risk. Can one teenage girl and her unexpected companion possibly stop someone who’s willing to put the entire world in danger in the name of greed? 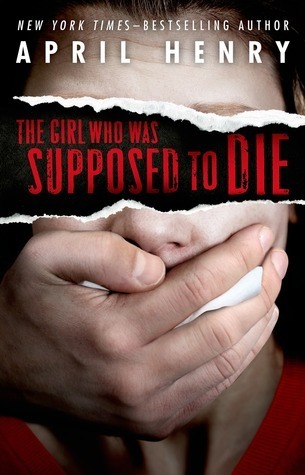 Just what will become of this girl who was supposed to die? I feel like I’ve given way too much away here, and I apologize for that. I didn’t mention several of the major points in the book, so there are still a few surprises in store for those who choose to pick up this thriller. 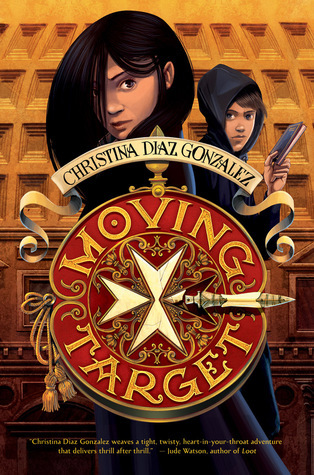 I would recommend the book to any middle grade, YA, or adult reader who is in the mood for a good mystery or suspense novel. All that being said, I did have one issue with The Girl Who Was Supposed to Die. In my humble opinion, the ending was a little too abrupt. It seemed like there was a ton of build-up, and–BOOM–it’s over. Maybe I’m the only one who feels that way. Read the book for yourself, and let me know what you think. If you’d like more information on this book and other mysteries by April Henry, check out the author’s website. You can also connect with the author on Twitter and Facebook. It’s hard for me to believe that it’s been almost nine years since Hurricane Katrina hit. I can remember the feelings of horror when everyone learned of the devastation on the Gulf Coast, particularly in New Orleans. I recall watching the news reports, donating to food and supply drives, and seeing new people–those who had lost their homes in the storm–move into the apartment complex I was living in at the time. In many ways, Katrina opened everyone’s eyes to the damage that Mother Nature was capable of…and how the best and worst in people could be revealed from such a tragedy. Even now, we wonder when the next big storm will hit and if the lessons learned from Katrina prepared people–especially the powers-that-be–for the worst. After Katrina, many books, both fiction and nonfiction, were written talking about people who made it through the storm. Until yesterday, I had only read one of those books, Hurricane Song by Paul Volponi. That book showed YA readers what it may have been like for someone who had to take refuge in the Superdome. The language was a bit rough in that book, but I felt it did adequately reflect everything about that situation. My latest read, though, comes at things from a different perspective. 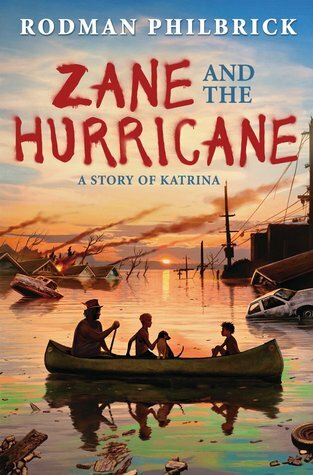 Zane and the Hurricane by Rodman Philbrick, looks at Katrina from a twelve-year-old boy’s perspective. This book, suitable for upper elementary and middle grade readers, doesn’t have any coarse language, but it paints a very realistic picture of the peak of the storm and it’s tragic aftermath. I think it’s accessible to young readers–many of whom have no memory of this bleak point in American history–without being too graphic. At the same time, Zane and the Hurricane doesn’t sugarcoat anything. It shows readers that this was a time of fear, pain, prejudice, and even hope. Zane Dupree, a twelve-year-old kid from New Hampshire, is not exactly thrilled about spending a week in New Orleans. He’s never been there, he’s never met the great-grandmother he’ll be staying with, and he doesn’t really know what to expect from his visit. At least he gets to take his dog, Bandy, with him. At first, things aren’t as bad as he thought they would be. His great-grandmother, Miss Trissy, might be an older lady who walks with two canes, but she sings like an angel, and she’s got a story or a song for everything. But stories and songs won’t prepare anyone for the storm about to hit the city. Hurricane Katrina is on her way, and Zane, Bandy, and Miss Trissy need to get out of New Orleans fast. It should have been a simple evacuation, but Zane’s frightened dog leads him right back into the city that is soon to be destroyed. As Zane and Bandy hole up in Miss Trissy’s house, the storm hits. Winds scream through the long night, and, as morning dawns, Zane watches as water overtakes much of New Orleans. Their only hope is to make it to the sweltering attic and hope that help will come soon. Help comes in the form of a canoe, a musician named Tru, and Malvina, a young girl with a joke for even the most somber of occasions. As Zane, Bandy, Tru, and Malvina navigate the waters that have flooded the city, they are confronted with death, destruction, and both the best and worst in humanity. Some people are willing to give aid to others even when they don’t have much themselves. Others either look to exploit the situation or only worry about themselves or saving things as inconsequential as Oriental rugs. There seems to be no real rescue coming from any source, so it’s up to this foursome to save themselves. Zane and company have to stick together, even when it would be easier to leave someone behind, if they’re to have any hope of making it out with their sanity–and their humanity–in tact. Zane and the Hurricane is a story that pieces together very real stories from the catastrophe that was Hurricane Katrina. It addresses the lawlessness that plagued New Orleans, the absence or apathy of law enforcement, lack of medical care, the fear and prejudice against poor African-Americans who were just trying to survive, and the horrible conditions both outside and in the Superdome, also known as the “shelter of last resort.” It also highlights that there were people who behaved like true heroes. People who rescued others from flooding homes, people who gave freely of what little water and food they had, and people who stood up for those who were doing everything possible just to make it one more day in grim circumstances. Like I mentioned previously, I think Zane and the Hurricane is a good read for upper elementary and middle grade readers. I plan to add this book to my own school library. It is a very realistic portrayal of a dark time in our recent history, and I think it could lead to some deep conversations about the impact of catastrophic events and how humans respond to them. For more information on this book and others by Rodman Philbrick, check out his website, Twitter, and Goodreads. Spoilers ahead! 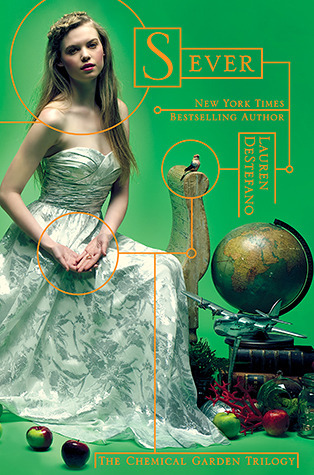 If you haven’t read the first two books in Lauren DeStefano’s Chemical Garden trilogy (Wither and Fever), do so now! This post will focus on Sever, the third and final book in the series. Nearly two years ago, I began reading Wither, the first book in The Chemical Garden series, a dystopian trilogy by Lauren DeStefano. From the start, I was mesmerized–and often horrified–by the world presented in this series. Fever, book two, only increased my horror at the world that Rhine, our protagonist, is forced to navigate. And now, I’ve finally made my way to book three, Sever. In this book, Rhine continues on her quest to save herself and those around her, but, as they so often do, circumstances seem to conspire against her. As Sever begins, Rhine continues to struggle with the experiments Vaughn, her vile father-in-law, has done on her. She is trying to cope with the knowledge that he has killed others before her, and she knows that he’s not done with her. Rhine is also eager to find her twin brother, Rowan, and get back to Gabriel, the boy she left behind in Manhattan. With the help of Linden, her former husband, Cecily, her sister wife, and Reed, Vaughn’s estranged brother, Rhine is, at the very least, able to avoid Vaughn’s clutches for a while. Rhine also learns a bit more about her brother’s activities. He believes her to be dead, and he has become the leader of what can only be called a terrorist group. He is blowing up scientific research facilities. He appears to believe that they are wasting their time experimenting on young people and looking for a cure that just doesn’t exist. Everything, though, is not as it seems. Vaughn has far-reaching power that follows Rhine wherever she goes. But Vaughn’s many deceptions will soon be uncovered in a very unlikely place. In Rhine’s quest to find her brother, she returns to the hellacious carnival that was once her prison. Secrets are revealed here that will not only lead Rhine to her brother but may also lead to Vaughn’s undoing. As Rhine learns more and more about Vaughn’s research, her parents’ work, her brother’s supposed rebellion, and her own place in the world, she realizes that everything is much more complicated than she ever believed. And when she factors in her tumultuous relationships with Linden, Cecily, Rowan, and others around her, Rhine is more befuddled than ever. How can Rhine hope to make sense of what’s going on around her when she can’t seem to come to terms with what’s happened to her and those she cares about? Lives have been lost and promises broken in this mysterious quest for a cure, but is it worth it? Why is Rhine so important to this search, and, if a cure is found, what then? Is Rhine doomed to be a prisoner forever? Or is there a way out? A way that not even Rhine would dare to dream of? Questions will be answered and secrets revealed soon, but is anyone prepared for what will be uncovered? Unravel the mystery when you read Sever, the gripping conclusion to The Chemical Garden trilogy. I do think that the action in Sever was a bit slow at times, but I still found myself enthralled by the story. I do wish, however, that we had seen more of Gabriel and Rhine’s relationship with him. Even with the way the book ended, that story feels kind of unfinished. When I first started this series, I couldn’t stand the character of Cecily. In Sever, however, she definitely showed an inner strength that most women–never mind fourteen-year-old girls–don’t possess. She survived so much and grew into a young woman with a core of steel. Even Rhine was surprised by how much her sister wife had matured in such a short time. Cecily grew from an annoying little girl into a young woman capable of enduring unimaginable grief and tribulations. Out of all the characters in this series, I think she changed the most. She went from an easily manipulated pawn into a queen taking charge of her own destiny. If you want a rather disturbing view of what the future could hold, I suggest you give Wither, Fever, and Sever a try. You may like this trilogy; you may not. Every reader has his/her own taste, and that’s okay. (I say this because another blogger called me out for daring to give Fever a positive review. She’s entitled to her opinion, but I stand by my view that this is definitely a series worth reading.) This series does deal with some mature themes, so I would caution you before recommending it to middle grade readers. If you enjoyed series like Delirium, Matched, or The Selection, then The Chemical Garden may be right up your alley. For more information on this series or other books by Lauren DeStefano, check out the author’s website, Facebook, Tumblr, and Twitter. You may also want to take a quick look at the Sever book trailer below. Enjoy!